Understanding the causes of slab or structural settlement is key for the contractor to help identify potential opportunities for slab jacking with polyurethane. Though there are many reasons for sunken slabs, we have identified the three main conditions that cause the settling issues we like to fix. These include erosion, poor compaction, and biological decay. 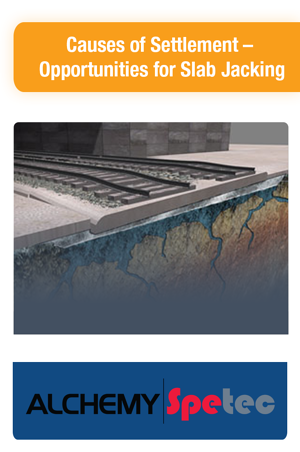 Erosion is the most common cause of settling and the most common reason for slab jacking. Poor drainage, improperly placed downspouts, leaking drain pipes, and broken water lines are common culprits. Water can either slowly erode soil over time, or very quickly erode away the soil beneath a concrete slab or structure causing it to settle. When backfilling on a jobsite, the site contractor is supposed to walk in backfill (drive over it with heavy equipment) and compact it in small lifts. However, this isn’t always done properly for one reason or another (inexperienced operators or people taking shortcuts). The result can be soil that will continue to compact itself and settle over time. A great example of this is bridge approach slabs. These slabs are found on roads and highways all over the world. Bridges typically sit at a higher elevation than the roads that approach them. During construction, the final section of road (typically a concrete slab) is built on backfill to raise the elevation to meet the bridge. Over time, the slabs can settle due to poor or improper compaction. Compounding the problem is the fact that when a slab settles a little, the expansion joint opens up and allows water to get underneath the road, adding erosion to your compaction problem. Construction trash pits, buried trees, and other biodegradable materials all eventually break down. Sure enough, there always seems to be some corner of a building or a separate parking area or driveway that ends up right over it. These situations can range from slight settling to very severe. Sometimes you have a combination of factors that cause settling. As we discussed in the bridge approach slab issue, poor compaction can lead to settling which will open a joint and allow water to compound the problem with erosion. Property owners and managers should not ignore these problems, or they will become more expensive to fix over time.